Additionally we hope to connect with people and organizations who share our vision and to work together for our common cause. We are also planning to launch a collaboration platform for such individuals and organizations to help them to work together and also to harness the power of the web to improve their efficiency. For all you international readers(readers outside India), you may have heard of our state Kerala with respect to linux and free software. Our government switched from Windows to Linux in all government schools. 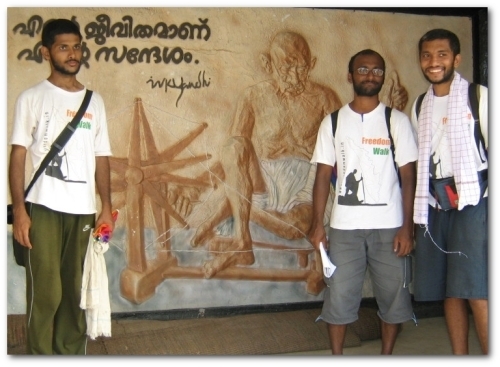 Today the group – Anoop John, Cherry and Sooraj – reached Cochin – my city. So me and a few guys from our local LUG group decided to join them. We walked across the city stopping at collages and some institutions to present our case. It was a great experience – but I have to admit – my legs are in a bad shape right now. More details on today’s walk will be posted on ILug Cochin site.